Damn. Venezuela does it right. Guess what, it’s not just the Venezuelans who love their plantains, it’s also me, myself, and I (and hopefully you too). If you’ve never tried a double fried green plantain, well friend, now’s the time. Seize the day. The patacón is made up of a “green (that is, unripe) plantain that’s been sliced lengthwise, fried, pressed flat and fried again. Still warm, the golden discs embrace shredded beef, roast pork, chorizo, chicken or cheese.” The article described a couple versions, most with meat, tomato, lettuce, and a sauce of some sort, so I decided to try my best at veganizing the very meaty treat. As far as the wastefulness of the foil is concerned, it’s pretty darn hard to eat the sandwich without wrapping it in something–the sauce flies everywhere–so, well, it’s worth it. My personal patacón consists of the fried green plantain “bread,” chopped up and seasoned gluten, tomato, lettuce, and my own thrown together pink sauce. Is the ensemble authentic? Lord knows. Was it super ridiculously delicious? Amen. The gluten tasted like chorizo, the tomato was fresh, local, and juicy, the sauce was perfectly spicy & creamy, and the plantain was fried plantain goodness (there’s just no human way to describe the starchy perfection of it). You can substitute whatever you’d like, I’m sure, for the meat and the fixin’s, I think the only requirement is the fried plantain. So go for it! Seriously, right now, go make one! In a small bowl mix the veganaise, mustard, ketchup, and hot sauce to taste. It should be pink and spicy. Set aside. Heat up 1 tsp vegetable oil in a small pan. Chop up the gluten until it looks like shredded pork. Add to the oil and brown with fresh pepper and Cajun spice. Once slightly crispy and browned (like you’d want your vegan chorizo to be), remove from heat and set aside. In another pan, heat up 1/4″ vegetable oil for frying the plantains. While the oil is heating up, chop the plantain in half (i.e. halfway between the ends), then in half again lengthwise. Peel it. Fry the 4 plantain pieces on one side until golden (3-4) minutes. Flip over and do the same (mine took less time on the second half, 2-3 minutes). Carefully remove (I used tongs) the plantains and place on a cutting board or piece of parchment paper. Using the beer bottle, gently roll the bottle up the plantain from one end to the other flattening the plantain to 1/4″ thickness. BE GENTLE. You don’t want to smoosh apart or tear the plantain. Once flattened, fry each piece on both sides again until golden/golden brown. Remove and place on a paper bag to drain the excess oil. Now to assemble. Place one plantain slice on a piece of tin foil. Slather on a generous amount of pink sauce. Next layer a tomato slice or two, two or three heaping spoonfuls of the “meat”, some lettuce, and another slathering of pink sauce. 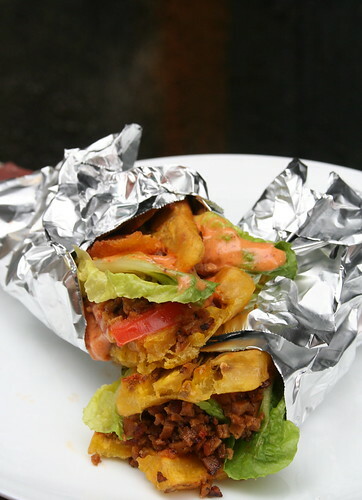 Top with another plantain slice, then wrap in the foil. Repeat with the other two slices. Eat while hot, be careful not to get pink sauce all over you, and come back to me with news about how awesome Venezuela is. Damn that looks awesome, you will never believe this but I was just talking about a similar sandwich YESTERDAY because my friend was asking me what to get at this cuban place, and they have the “platano loco” but it has ham and I was thinking how I really needed to veganize it. Yours looks so awesome, I wish I could eat it. Like, right now. I love plantains. I NEED THAT RIGHT NOW!!! Oh my YUM! oh yum this sounds awesome. I LOVE your website! But, although it’s summer vacation, my inner Spanish Teacher and compulsive grammar snob are itching to break out! I apologize in advance for the obnoxious level of this comment, but in the interest of accuracy and because I seem wholly unable to stop myself… The plural of patacón would be patacones (no accent, with an ‘es’ on the end). They look delicious though! What a tasty idea! I love the beer bottle trick! Oh awesome! I took Spanish my freshman year of college but I definitely don’t remember too much of it. I so much prefer to be accurate! Wow! Those look amazing. In the off chance that we ever really are neighbors, we are throwing one hell of a dinner party. I’ve never even heard of patacones, but now I’m quite curious. uhh… is 10:30 in the morning to late to cut out of work, go home, get drunk, and make myself a patacone? ..oh… was getting drunk not part of the recipe??? this recipe has such a fun, street food touch to it! im bookmarking to try! Wow – best sandwich ever! I’m living in Venezuela right now. Typically, you can only get these in Maracaibo – a city 9 hours away from where I live. You can also make these with ripe plantains (platanos maduros), which makes for a sweeter sandwich. Another way to prepare the patacones is to layer the fried plantain strips and press them until they are smashed together about the size of a slice of bread (I use two plates for this), and then re-fry that. So good! Thanks for the vegan version – it’s hard to eat authentic Venezuelan food and be vegetarian!